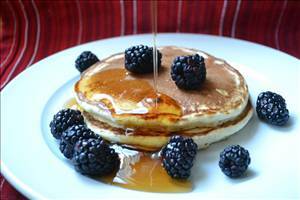 An oh so good simple pancake recipe. Mix the flour, baking soda, sugar, and baking powder in a large bowl. Melt the butter in the microwave and let cool slightly. In a jar with a tight fitting lid, put the milk, egg, butter, and lemon juice and shake vigorously for 3 minutes - making sure the egg is combined. Mix just until incorporated then let the batter sit for a minimum of 15 minutes - this ensures fluffy pancakes every time. 86 members have added this recipe to their cookbook. Really tasty. I made several substitution and it still worked out great. I used Bob's Red Mill egg substitute instead of the egg, unsweetened coconut milk for the skim milk and coconut sugar for the traditional sugar. I also added the zest of the lemon and for the flour used part whole wheat, part unbleached and part 10-grain hot cereal mix. They were delicious and satisfying with a delicate lemon flavor. Yum. Batter was viscous resulting in denser pancakes but the flavor was excellent. I modified slightly by adding cinnamon. Really good. I added 1 tsp of vanilla extract and about 1/3 cup of blueberries. I don't think I've ever made such fluffy pancakes. The batter is thicker than I expected, but actually made it easier to work with. There are 127 calories in 1 serving of Sunday Morning Pancakes. Calorie break-down: 25% fat, 63% carbs, 12% protein.